Happy All souls day: we pray for our loved ones who have gone before us. We pray that they rest in peace. In Christianity, All Souls’ Day commemorates all those that have gone before us, the Holy, or the Faithfully Departed; that is, of those who have died. Observing Christians typically remember deceased relatives on the day. The Pope designated November 1 as a time to honor the saints and martyrs, a holiday that became known as All Saints Day. The day took on some of the Samhain traditions. The evening became known as All Hallows Eve – Halloween. 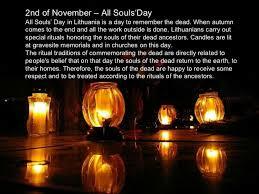 The next day, November 2, is All Souls Day, when the dead are remembered. To Christians, it is a time for people to pray for the dead. The tradition was based on the idea of purgatory – a stage between heaven and hell. It also begins ‘the month of the dead’, which takes place in November in the Christian tradition.